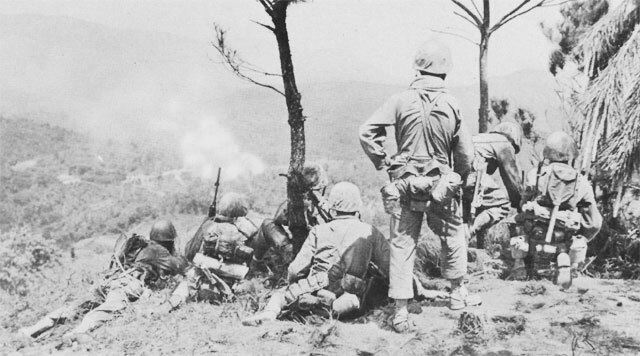 PUSHING TO YAE-TAKE, infantrymen of the 6th Marine Division pause on a mountain top while artillery shells a Japanese position. 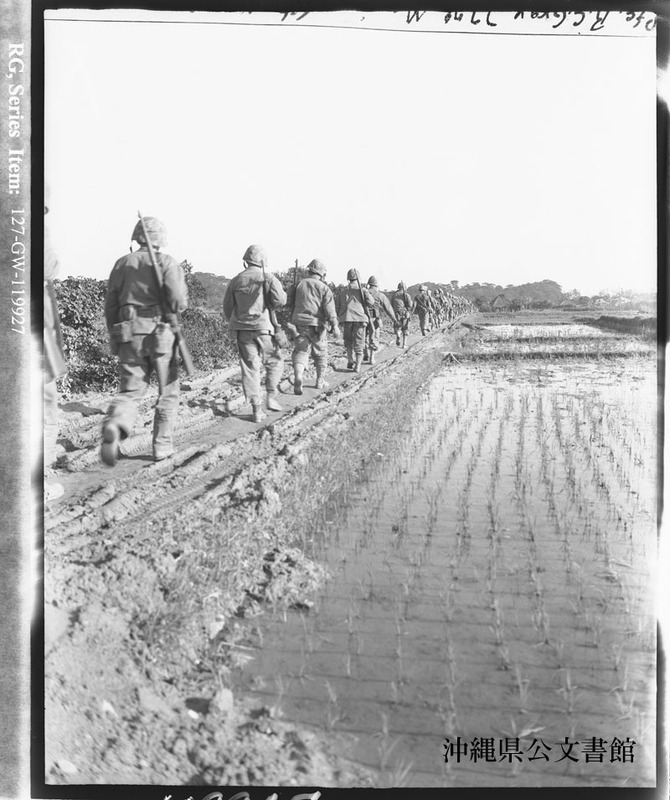 Same patrol moving through rice paddies in early morning sun. 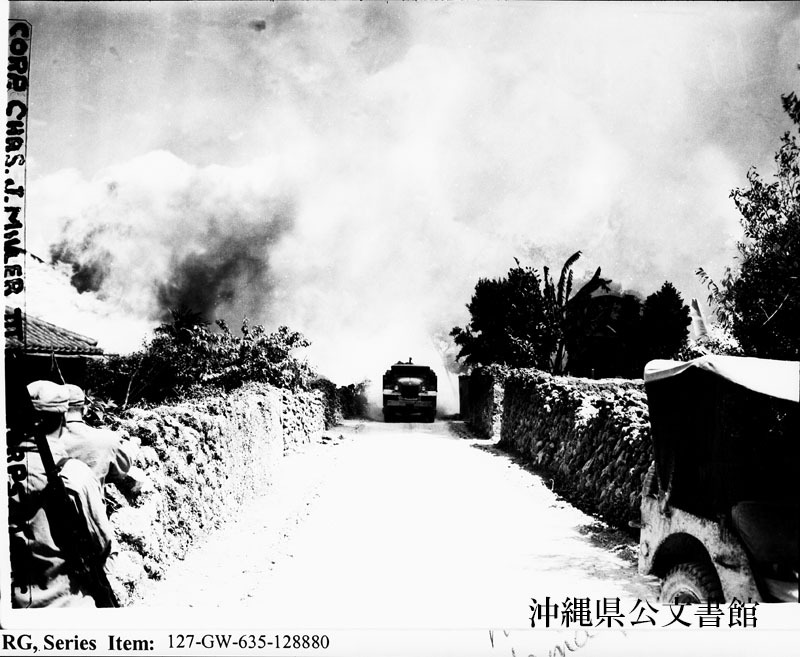 A U. S. Marine truck runs a gauntlet of fire as it dashes through the street of a burning Okinawa village. Aerial view of Ie Shima, Okinawa Gunto, Ryukyu Islands. 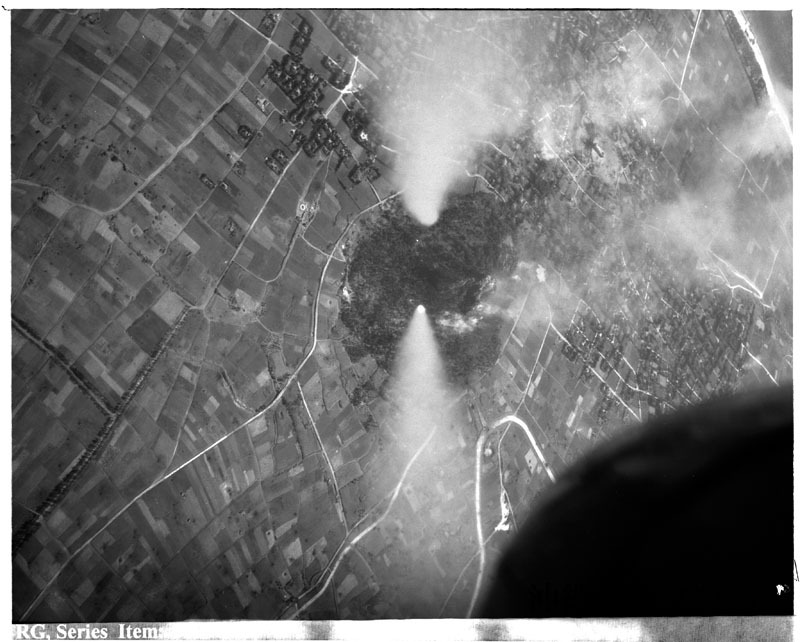 Taken with a package camera installation on F6F-5 plane from USS RANDOLPH (CV-15). Fires burning on island. 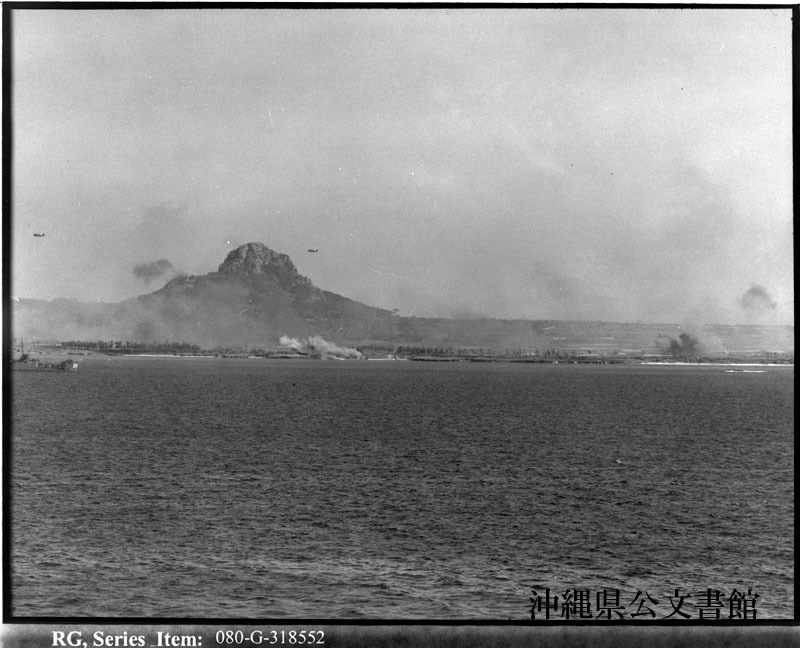 Dive bombers operating during pre-invasion bombardment, Ie Shima, Ryukyu Islands. Taken by USS TEXAS (BB-35). Speed Graphic 15” lens, 1/200” F6.3 K-2 Filter. Pfc. 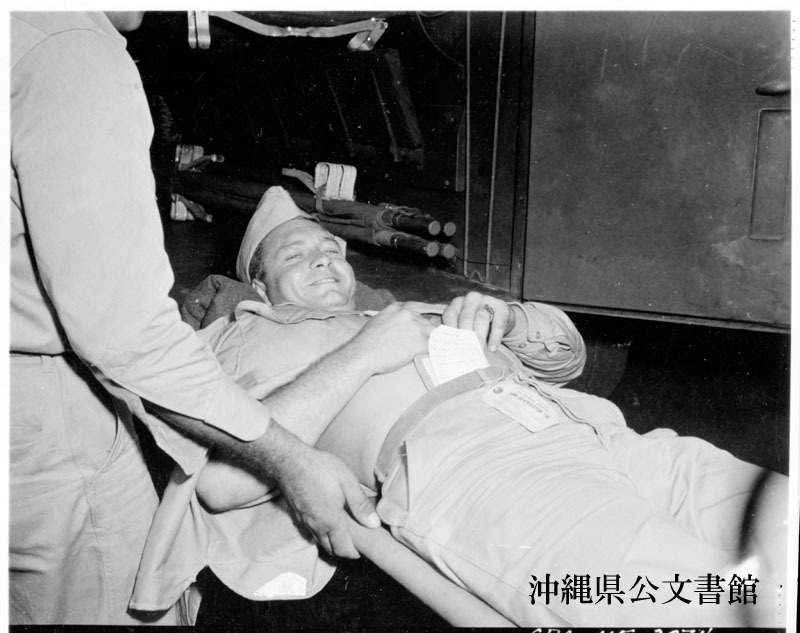 George Stilwell, (Eva*******) Arizona, a member of the famed 7th Infantry Division, is being lifted into an ambulance to be taken to an army hospital. Pvt. 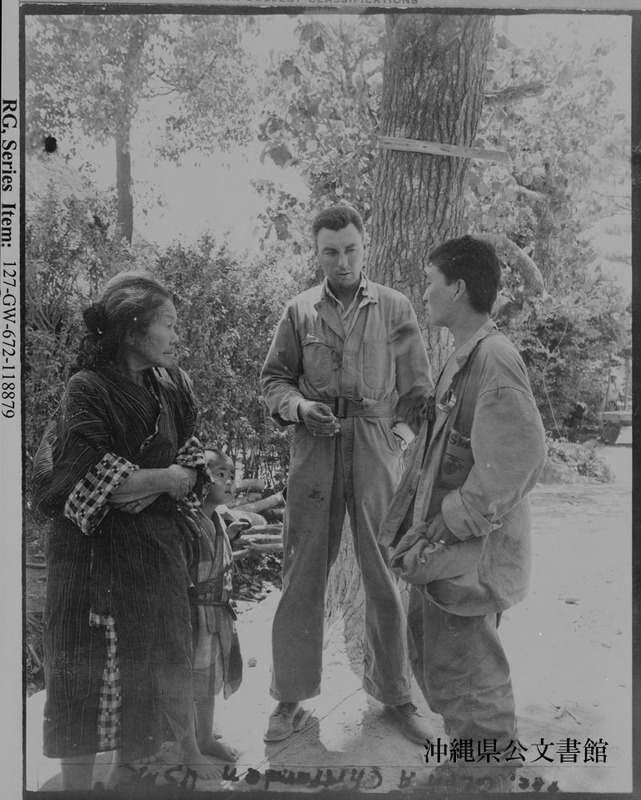 Stilwell was wounded on Okinawa by a Japanese machine gun bullet in his right shoulder. He will receive expert medical attention in the army's hospital in the Hawaiian Islands. 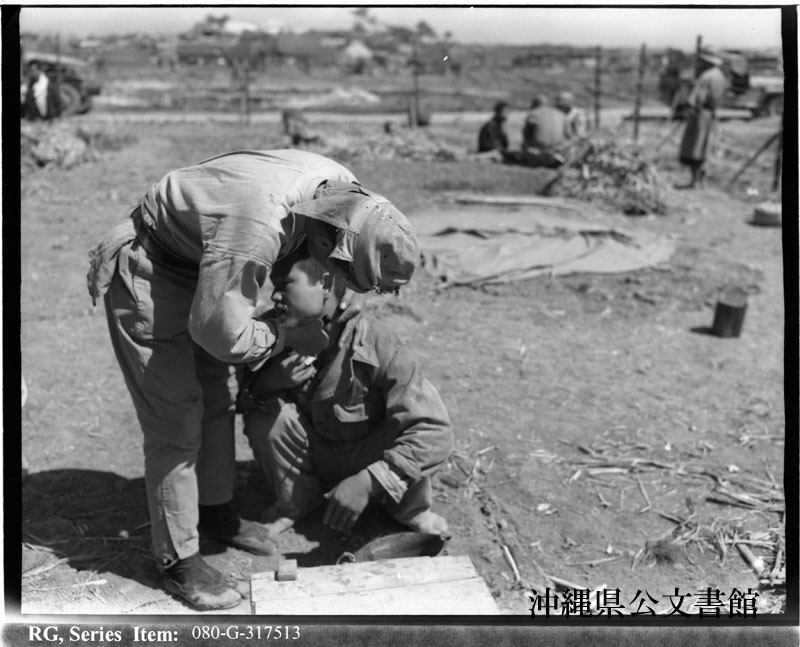 A Jap doctor treating a Jap in a prison camp on Okinawa in Ryukyus. 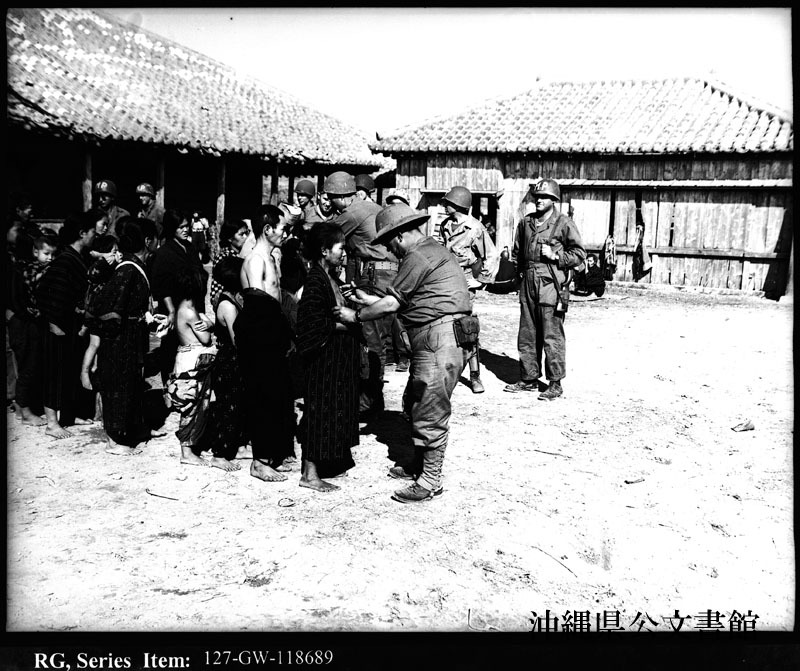 Serious cases are taken to U.S. first aid stations. 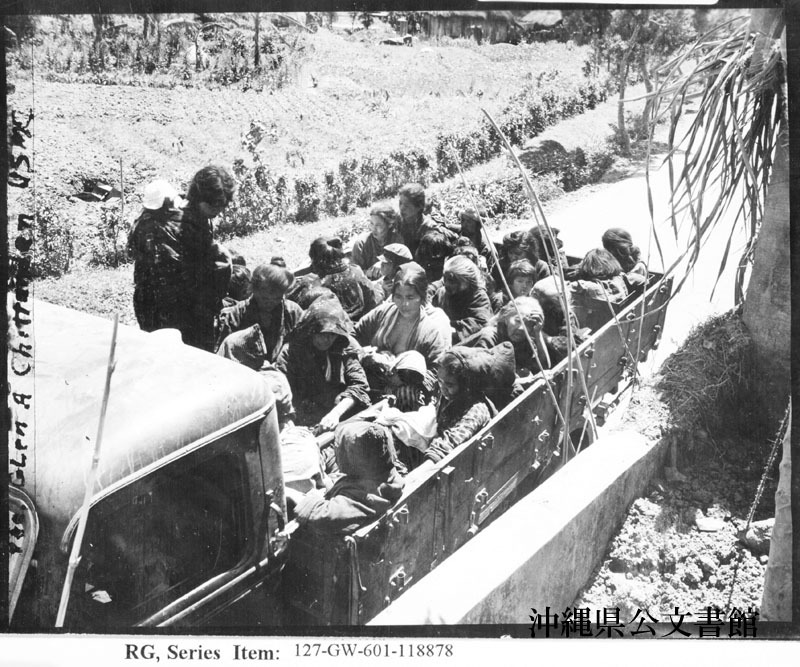 Okinawan families crouched in a truck just after being brought down from hills to be established in a new home. 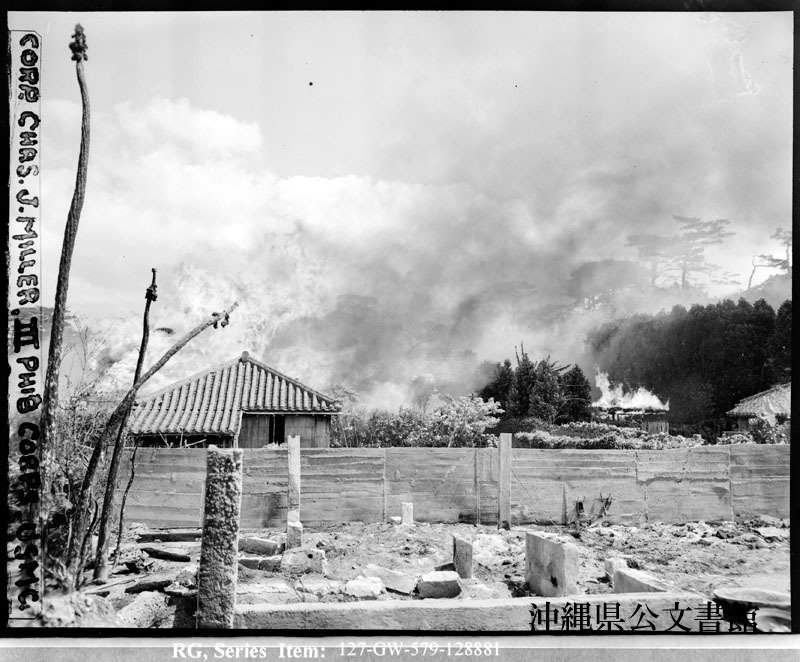 A view of a burning Okinawan village. The flimsy straw construction of the homes makes good fuel for the eager flames. 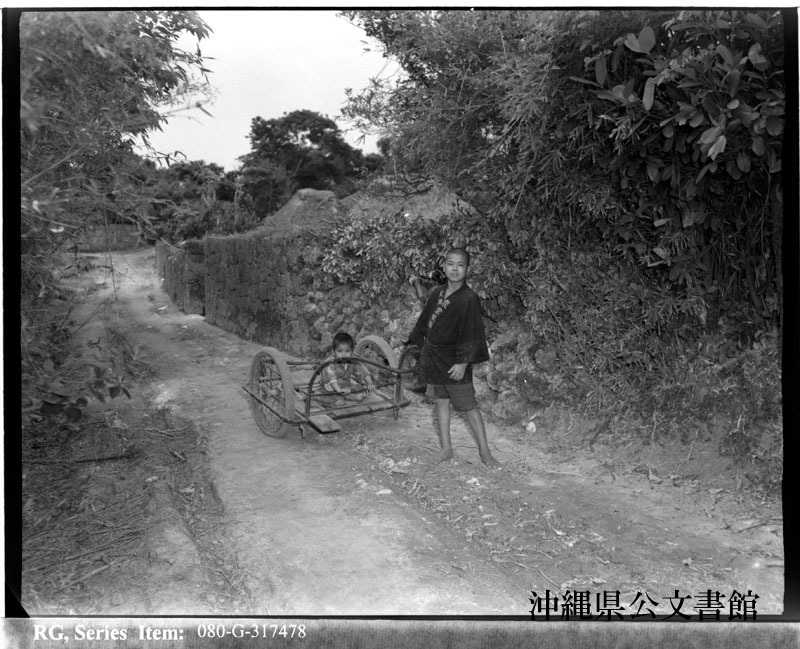 Okinawan village boys. In background are typical stone walls. 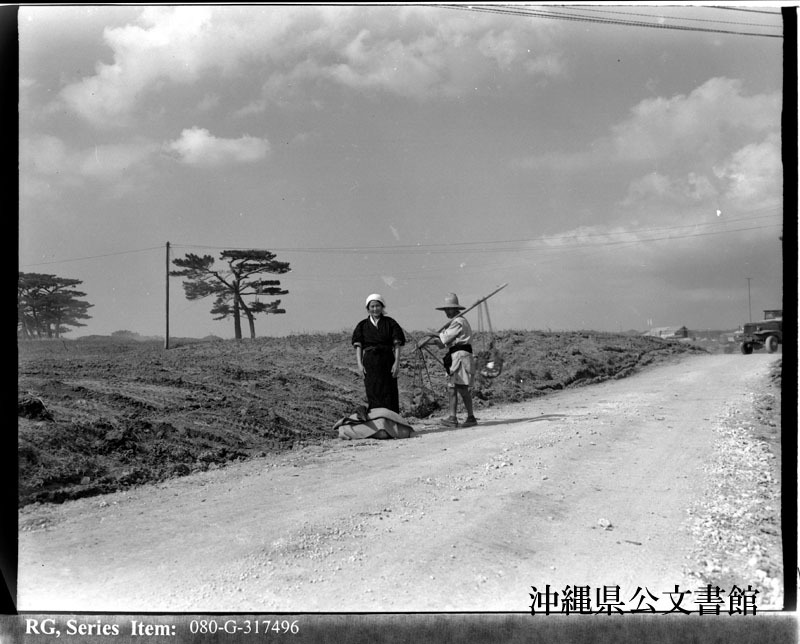 Refugees returning to their homes and farms on Okinawa in Ryukyus after U.S. troops have passed. 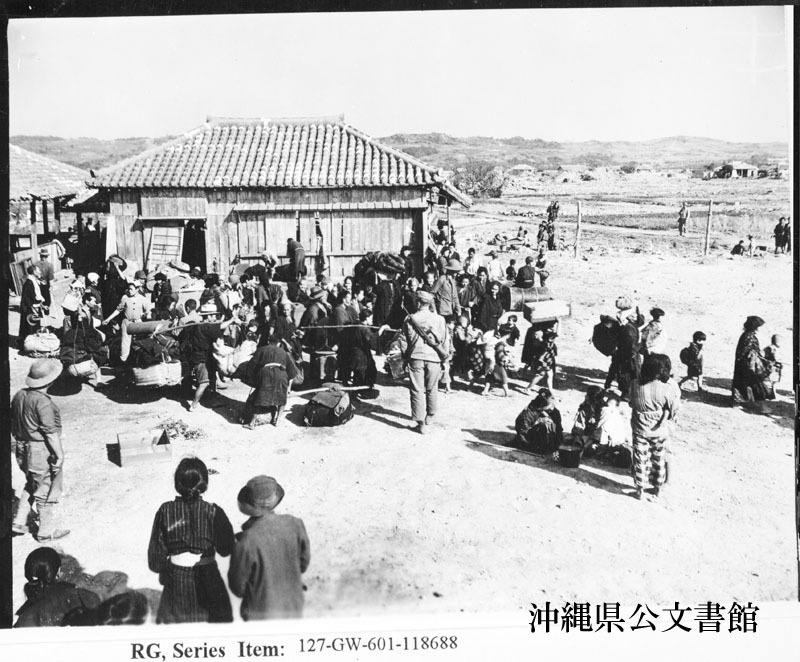 Civilians lined up for allotment of rice and salt in the village of China [Kina], south of Yontan Airfield on Okinawa in Ryukyus. 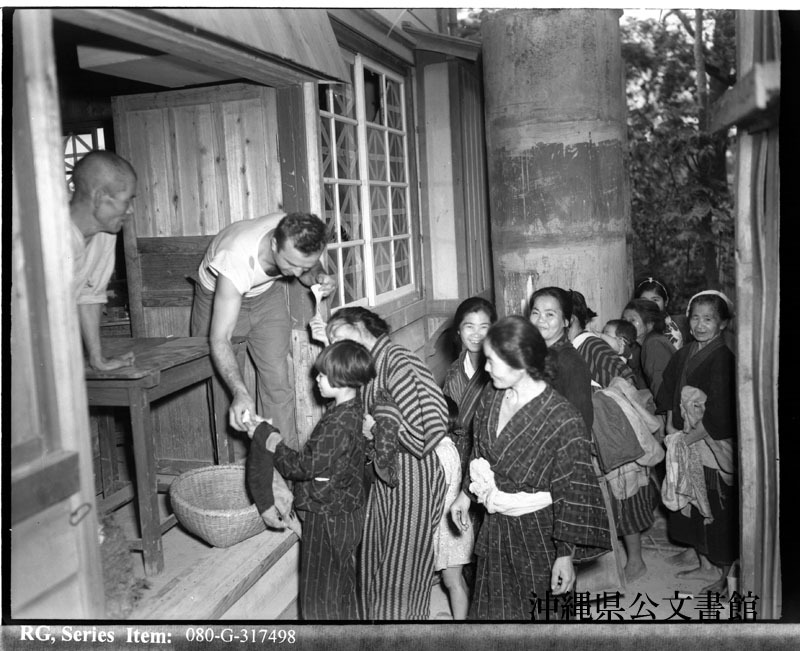 A Navy Engineering Officers attached to military government listens while a Jap interpreter tells a group of Okinawans that they are liable to be shot by Marines if they wander out at night. 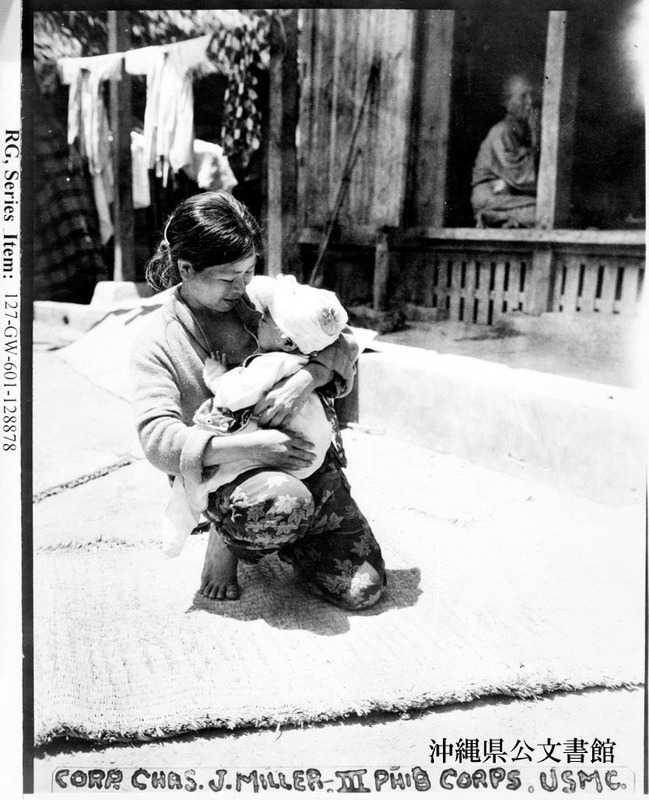 Okinawan mother and her injured child.